Paris was found a few days ago in Ormos of Aegiali by a Greek tourist who came to Amorgos on holiday. One night she heard a kitten crying nonstop. The next morning she decided to go look for it. Soon she found a kitten trapped in a crate with only a bowl of dried milk. She brought the kitten to her room and she searched for an animal welfare organization on the island. Fortunately she found AZI and contacted Litsa, AZI's program coordinator. In Chora they met to transfer the kitten. Unfortunately the tourist already has five cats so she couldn't adopt him but she is searching among her friends to find a good home for him. Little Paris is doing very well. 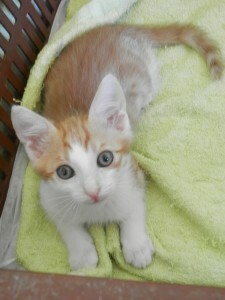 He is about 2 months old, has respiratory disease and an eye infection but his health is improving steadily in our care. When he finishes his treatment he will be available for adoption (microchip# 941000016719325). He is a very sweet and smart guy and he plays all the time. If you would like to help him find a home, please consider making a donation to Animal Zone International. Thank you!